Dr. Gary Mathern, professor of pediatric neurosurgery and director of the UCLA Pediatric Epilepsy Surgery Program at UCLA Mattel Children's Hospital, has been appointed co-editor-in-chief of Epilepsia, the official journal of the International League Against Epilepsy (ILAE) and the leading source for current clinical and research results on all aspects of epilepsy. Mathern will serve as co-editor-in-chief with Astrid Nehlig, a researcher at the INSERM facility in Strasbourg, France. The pair will begin their four-year term starting July 1. According to the ILAE, Mathern and Nehlig were selected through a multi-tiered process in which applicants presented their thoughts about the future development of the journal and how it can continue to serve the international epilepsy community in an era of rapidly changing approaches to communicating new scientific information. Mathern's clinical focus is on the surgical treatment of epilepsy, and his research work also involves the investigation of the neuropathology of epilepsy in the clinic and the laboratory. He has served the ILAE in a variety of capacities, most notably as co-chair of the Commission of Therapeutic Strategies and as chair of the Strategic Planning Commission. He has been on the editorial boards of seven journals and acts as reviewer for more than 30 journals. 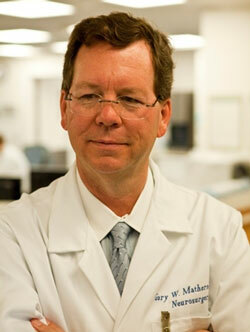 Mathern joined the neurosurgery faculty at the David Geffen School of Medicine at UCLA in 1996. He completed his neurosurgery residency at UCLA, his surgery internship at Harbor-UCLA Medical Center and earned his medical degree from Case Western Reserve University School of Medicine. For more information on the UCLA Pediatric Epilepsy Program, please visit uclahealth.org/Mattel/Pediatric-Neurosurgery/pediatric-epilepsy-program.